If your AdWords campaign costs are slowly creeping up, you’re not alone. As more businesses jump on the AdWords bandwagon, existing advertisers find it tougher to compete and rank for their chosen keywords. This translates into inflated Costs Per Click (CPCs) and Costs Per Acquisition (CPAs) across the board. The numbers don’t lie: if you were on Google AdWords back in 2008, you would only have paid $7.02 for each conversion on average. Fast forward to 2011, the average CPA increased to $19.74. And in 2017, that same CPA skyrocketed to $48.96. That’s a whopping 585% increase over just nine years. Don't want to keep increasing your marketing budget, year after year? Then you'll have to fine-tune your campaigns and make them more effective. You’re probably already A/B testing your ad copy and offers, but that aside, you should also work on improving your Landing Page Experience. In this article, we’ll discuss how you can do just that. What Is Google Adwords' Landing Page Experience? AdWords defines its Landing Page Experience as a “measure of how well your website gives people what they’re looking for when they click your ad”. Basically, this is Google trying to make sure you’re not advertising using bait-and-switch techniques, or trying to game their system. Whenever you create a new AdWords campaign, Google analyses your landing page through a combination of automated systems and human evaluation. If they’ve determined that you offer a good experience, all things being equal, you’ll get enjoy a higher Quality Score (basically a measure of the quality of your ads, keywords, and landing pages). Quality Score aside, your Landing Page Experience also influences your Ad Rank. This is a value that's used to determine your ad position (relative to your competitors’ ads), or whether your ads will show at all. Together, your Quality Score and Ad Rank have a vast impact on the CPCs or CPAs that you end up paying. As you can see in the above example, it’s possible to pay 60% less than your competitors, and still have your ad displayed above theirs. Having a good Ad Rank also comes with other benefits. When your Ad Rank is sufficiently high, AdWords may also show your Ad Extensions (call buttons, location information, website links, all that good stuff) together with your ad. You won’t get charged more, but you’ll get more real estate to play around with. This increases the likelihood of visitors clicking through to your site, or contacting you in some other way. AKA: don’t mislead or blindside your visitors. First, make sure that your content matches your visitor’s search intent. If someone searches for and clicks on an ad that says “Samsung NX2000 vs NX3000”, they’re probably looking for a product comparison page. Bearing this in mind, it doesn’t make sense to direct them to a specific model’s page. Running in the same vein, if someone searches for and clicks on an ad for a particular product, they wouldn’t want to be redirected to a “new in” or “all products” page. Simple enough, right? On top of that, make sure the headlines and other elements on your landing page are consistent with whatever is on your ad as well. Here’s a positive example: the ad above says “Men’s Velvet Sneakers”, and the landing page that’s linked to this ad says the exact same thing. And here’s a negative example. 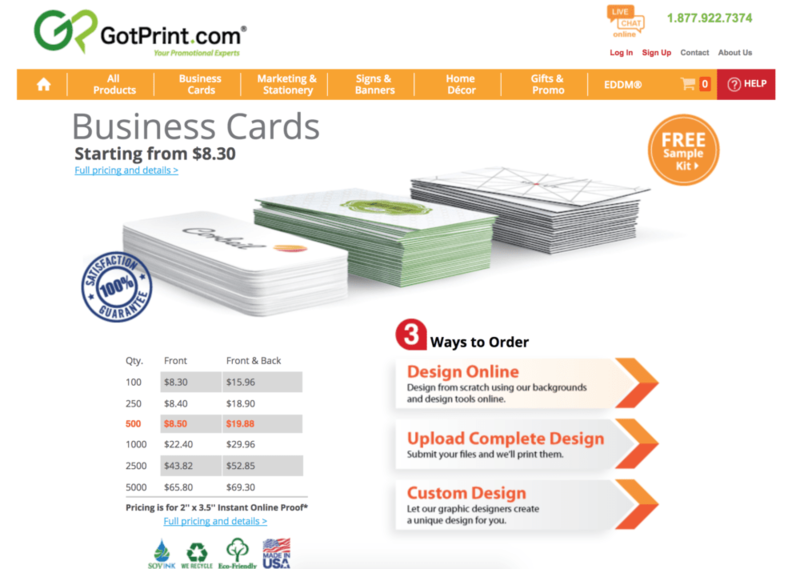 This ad says $8.50 for 500 business cards, but click through to its landing page, and you’re looking at a different figure ($8.30) instead. Why is it so important to have your headers be consistent? You want to reduce your visitor’s cognitive load, and make it obvious that they’re on the right page. If your visitor falters for even a second, or gets even momentarily confused, then you’re doing it wrong. Now, I know that some eCommerce store owners like to inject some personality and humour into their copy. That’s perfectly fine, but bear in mind that there’s a time and place for everything. But simply: “Men’s Velvet Sneakers”. One last tip when it comes to the content on your landing pages: Google also values original content, so make sure you’re not simply lifting your product descriptions and other copy from your manufacturer’s site. Instead, write your own descriptions and make these comprehensive and informative for your visitors. After making sure your content is useful and relevant, the next step is to ensure that your landing page “promotes transparency” and “fosters trustworthiness” (Google’s own words). There are two ways in which you can do this. First, display trust signals such as payment, security, and SSL badges on your landing page. There are a ton of these that you can choose from, but the team over at ConversionXL did a survey, and found that PayPal was the most trusted brand. Badges aside, other trust signals include testimonials and customer reviews. The following product page, for example, displays a 5-star rating right under the product name (visitors can click on the rating to access the individual reviews). On top of that, the store has also created their own custom “14 Day Free Return” badge, and added a button to show how many people have wishlisted or favourited this product. These also go a long way in building trust. What if your landing page is a product search page, and you can’t fit in your reviews or testimonials? Simple - take a leaf out of Brooks Brothers’ book, and showcase each product’s overall rating on the search page. While this isn’t as compelling and doesn’t add as much value as an actual review, it does tell your visitor that they can access more reviews simply by clicking in. Trust signals aside, another way you can win over your customers is by displaying your company information clearly on your website. Let’s face it - it’s really easy to set up an eCommerce store these days. Pretty much anyone with a credit card can register for an account on Shopify, and have their store up and running in 30 minutes. As such, the eCommerce industry has attracted many sellers who are just in it to make a quick buck. These guys resell cheap, poorly-made items from China, and they don’t look out for their customers’ interests at all. Your goal is to demonstrate to your visitors that unlike these guys, you’re a legitimate business. And the best way of doing this is to display your address and contact details on your landing page, loud and proud. Contact information aside, be sure to feature your return and shipping policies prominently as well. Basically, instill confidence in your customer, and communicate that you’ll be ready and willing to help them out if something goes wrong with their purchase. Now that you’ve got your content and trustworthiness settled, the next thing to work on is your navigation. This is fairly straightforward, so I won’t dwell too much on it. Basically, organize your landing page well, so that your visitors have all the information that they need at their fingertips. Assuming that you’re running a product ad, make it easy for your visitor to order the product featured in your ad as well. As a general rule of thumb, I like to show my visitor the information or product they’re looking for above the fold, so they don’t need to scroll too much. While plenty of eCommerce store owners like to use pop-ups to get their site visitors to join a newsletter, make sure you don’t go overboard with these. Pop-ups are a turn-off to your visitors, and the more pop-ups on your site, the more you’re compromising upon your visitors’ Landing Page Experience. That said, do keep in mind that not all pop-ups are similarly invasive. A pop-up that appears right off the bat (when your visitor loads the page) and doesn’t feature a relevant offer is likely to be an annoyance. On the other hand, your visitors probably won’t take issue with an exit intent pop-up (pictured above) that offers them a special promo code right as they’re about to exit your page. The last step is to optimize your landing page to load quickly when someone clicks on your ad. Ideally, your landing page should have a fast loading speed on both desktop and mobile. But given that most consumers browse on mobile devices these days, it’s more important to get your landing page’s mobile speed right. Here’s a tool (provided by Google) that will score your page on mobile speed, and give you tips on improving your speed. Now, if you’re wondering whether there’s any benchmark when it comes to loading speed, most eCommerce stores try and aim for 2 seconds. Google, on the other hand, aims to have its pages load within under half a second. Generally speaking, the more high-resolution images you have on your landing page, the longer it takes your page to load. In fact, Unbounce looked at data from its Landing Page Analyzer, and found that 82.2% of marketers have at least one image on their landing page that requires compression to speed things up. If this is an issue for you, there are plenty of free tools online that you can use to compress your images. While you’re looking into your landing page’s loading time, keep in mind that this doesn’t just affect your Landing Page Experience and your CPC / CPA. It also has a direct and notable impact on the number of people churning from your store (which in turn affects your sales and revenue numbers). As seen in the graph above, your bounce rate starts climbing drastically once your loading speed exceeds 3 seconds. The bottom line? Quick loading time isn’t a nice-to-have; it’s a must-have. Do everything in your power to make sure that your visitors aren’t kept waiting. When trying to optimise their AdWords campaigns, plenty of eCommerce store owners obsessively A/B test their ad copy or offer, but neglect to pay attention to their Landing Page Experience. So think of this as your lowest hanging fruit, and a way for you to get a leg up on your competition. To maximise your ad budget and send more traffic to your site, this is the way to go!